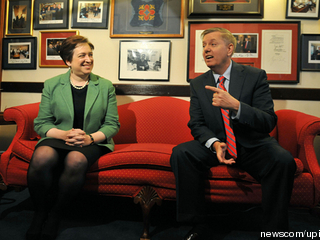 Lindsey Graham’s lone vote as a Republican prevented the filibuster by the Republican Party. He must be term limited in 2014 for another one of his play nice blunders. Had the Republicans been able to block her with her far left leaning she is potentially a greater threat along with Sotomayor to destroy the Constitution. During partial birth abortion babies are pulled feet-first from the womb and stabbed through the back of the skull. This disgusting technique is never a necessary medical procedure. But, Barack Obama’s Supreme Court pick Elena Kagan not only promoted it and lied about it with one medical group, she tried to push the American Medical Association to approve of the gruesome procedure.